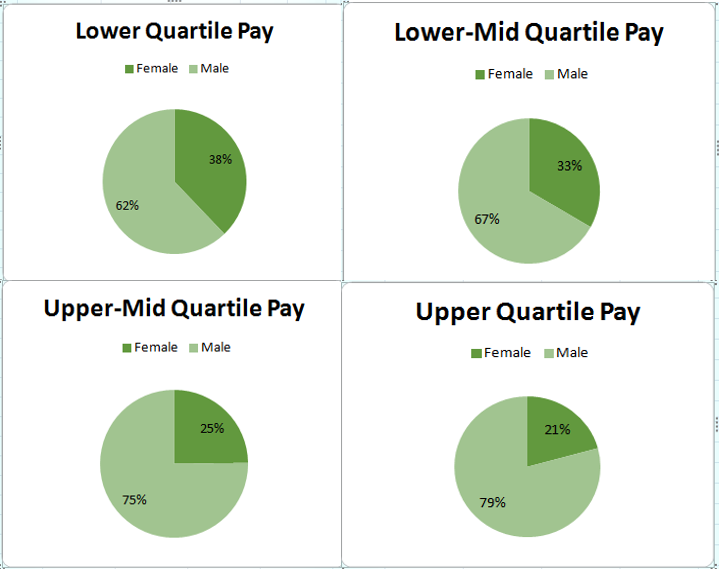 De La Rue’s gender pay gap data for 2018 is shown in this report. These statistics are drawn from data referencing a “snapshot” date of 5th April 2018. The gender pay gap looks at UK based jobs at all levels (as compared to equal pay which is concerned with addressing pay issues of men and women performing the same or similar work). We are required by legislation to report only on employing entities with more than 250 employees. For De La Rue, this requires us to reference the 1467 UK based employees who were part of the entity known as De La Rue International Limited, as at the “snapshot date”. This year's gender pay gap of 15.37% (mean) or 17.47% (median) is higher than in 2017, but the bonus gap of -2.25% (mean) or 22.88% (median) has decreased. Analysis, however, has shown us that these differences are primarily due to two main organisational reasons not linked to our Inclusion and Diversity Strategy. Firstly, at the end of the 17/18 FY De La Rue sold 90% of its shareholding in the Group's paper business to Epiris and retained the remaining 10% shareholding. This change of ownership meant that c500 employees transferred out of De La Rue to Portals in March 2018. Significantly a larger percentage of males, particularly in the lower two pay quartiles, transferred out compared to females; this decrease in UK employee numbers changed the overall male/female pay ratio and also our gender pay gap. Secondly, individuals in roles covered by our collective bargaining agreement received a lump-sum as part of the 2017 pay settlement. These payments are included in the bonus data and consequently show that a high proportion of our employees received a bonus during the year. It should be noted that this payment was unique to 2017 and if we remove this payment from the data, the mean and median bonus gap are more in line with the 2017 figures. Our long-term commitment to eliminate any pay gap remains. We continue to strive towards improving our proportion of women in the senior roles, this we believe to be the underlying reason behind our gap. To reflect our ratio between males and females overall in the UK, we aim to increase the proportion of women within our leadership group to 30% by 2020. Since our 2017 report, issued in January 2018, we have been working with our recruitment partners to improve the diversity of our shortlists including the use of ''blind'' CVs and have piloted an employee inclusivity survey in our Head Office. We are also continuing to develop our existing activities such as unconscious bias development and flexible working. We can confirm that the data published in this report satisfies the requirements of the Equality Act 2010 (Gender Pay Gap Information) Regulations 2017.